Two revolutions in ten years, is Kyrgyzstan any better off? 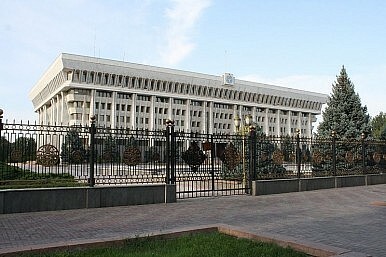 The Kyrgyz presidential office building–called the White House–looms in Stalinesque grandeur behind black wrought-iron gates just off Ala-Too Square in Central Bishkek. On April 7, 2015 Kyrgyz President Almazbek Atambayev participated in ceremonies commemorating the second Kyrgyz revolution at the site of its pivotal moment. “Today we can firmly say that the April revolution saved the country from economic collapse and spiritual impoverishment. It opened the way for the revival of Kyrgyzstan,” he said. Five years ago, thousands of protesters gathered in Ala-Too Square, at the center of which stands a statue called Erkindik (Freedom) that had replaced the statue of Lenin, moved in 2003 to a smaller square elsewhere in the city. The protests began the day before in Talas, but quickly spread to the capital. Then-president Kurmanbek Bakiyev had himself come to power five years earlier as a result of 2005’s bloodless Tulip Revolution. In 2010, however, police tried at first to disperse the crowd with tear gas and rubber bullets, but then two trucks rammed the gates of the White House and the police opened fire with live ammunition. Bakiyev fled to Osh, in southern Kyrgyzstan, where there were no protests and where Bakiyev had grown up. In Bishkek, opposition leaders declared the formation of a provisional government under Roza Otunbayeva. A few days later Bakiyev resigned and fled with his family, first to Kazakhstan and then to Belarus, where he still lives in exile and which refuses to extradite him despite repeated Kyrgyzs requests. …the back and forth on May 13-14 was a turning point. Because many in the crowd that prevailed were minority Uzbeks, the struggle for political control of the region began to be seen as a battle for ethnic survival, especially among the Kyrgyz majority. That perception grew in the following weeks, fanned by local politicians as the national authorities in the north struggled to respond. The ensuing chaos claimed entire neighborhoods in Osh and Jalal-Abad, leaving over 400 dead (though some sources claimed that nearly 1,000 died in the violence). According to the UN and the International Crisis Group over 300,000 people were displaced and more than 100,000 fled to Uzbekistan. The violence and refugee crisis prompted Uzbekistan, which has at times difficult relations with Kyrgyzstan, to move troops to the border. Many remain displaced today and tensions between ethnic Uzbeks and Kyrgyz in the country’s south persist. In late March, state security detained (and later released) an American journalist who had been meeting with a human rights organization in Osh that is known for defending the rights of Uzbeks in relation to the 2010 clashes. Atambayev may say that the revolution saved Kyrgyzstan from “economic collapse and spiritual impoverishment,” but many are concerned about the direction the country is moving in both economically and politically. Kyrgyzstan is scheduled to join the Russian-led Eurasian Economic Union (EEU) in May. Russia’s recession, the consequence of western sanctions linked to Russian involvement in Ukraine and a simultaneous drop in energy prices, has spilled over into its Central Asian partners. The Asian Development Bank forecasts a decrease in Kyrgyzstan’s economic growth in 2015 and a rise in inflation. Meanwhile, democracy and human rights advocates in the country are increasingly nervous about the russification of Kyrgyz politics. A pair of laws are working their way through parliament–one would ban “LGBT propaganda” and the other, a “foreign agents law” would increase restrictions on NGOs. Both are modeled on Russian laws. Kyrgyzstan may not have made quite the progress either of its revolutions were hoping for. After Atambayev’s speech, a small crowd gathered outside the White House to protest against his government. What the Belarus-Russia Border Tiff Means for ChinaReforming Customs, Uzbekistan Nods Toward the Eurasian Economic UnionRemember the Eurasian Economic Union?China and Russia in Central Asia: Rivalries and ResonanceWhy Can’t Russia Exploit Trade Opportunities with India and Iran?